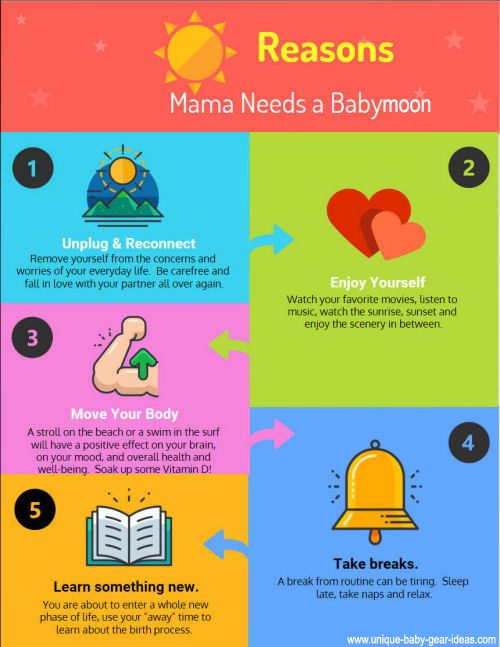 A babymoon getaway vacation before giving birth is an excellent way to recharge your mind, your emotions and yes, your body, before giving birth. Not so long ago, moms tended to avoid travel late in pregnancy. Now, with your OB/GYN's approval, kicking your heels up (figuratively speaking) is something to look forward to for physical as well as mental health and well-being. Go right ahead and plan the trip to the location of your dreams so long as medical care is nearby and no flying is required (ask your doctor) after a certain point. For nine months your focus has been on your changing body, moods and doing your best to stay on top of things in the face of nausea, aching muscles and swollen ankles. As such, relationships and emotional issues can be forced to take a back seat. A babymoon will present an opportunity to nurture and strengthen connections with your partner and older children. Pamper yourself and disconnect from the outside world. Schedule a couple's massage, a mani pedi and a facial. Dads love to be pampered as much as moms but some might be embarrassed to ask. What a wonderful opportunity to surprise him! Strenuous exercise might be out of the question but a stroll on the beach at sunrise or sunset or a walk around the gardens or a swim in the pool will keep you moving and energized. Walking, swimming and even making an appearance for spa treatments take effort. Make time to relax and rest in between activities. Remember that the reason for the vacation is to recharge and reconnect not to exhaust yourself running from one place to the next. Our brains need activity, too! Devote a little time each day while lounging poolside to educate yourself on the birth process. Learn more about relaxation techniques that will help you to give birth with less anxiety. If you plan to breastfeed, this is an excellent time to educate yourself and pick up some tips and tricks. Please stop by Unique Baby Gear Ideas and share your vacation pictures and recommendations when you return from your adventure.